The New Business of Acting: How to Build a Career in a Changing Landscape (Paperback) | The Drama Book Shop, Inc. 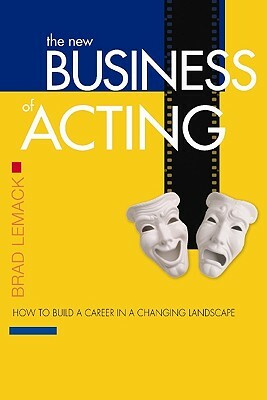 In an expanded and updated follow up to his popular, first book, The Business of Acting: Learn the Skills You Need to Build the Career You Want, talent manager Brad Lemack offers both young, new-to-the-business and "working" actors a vital perspective on the changing landscape in which they seek to launch and grow their professional careers. The New Business of Acting: Create and Launch an Action Plan for Career Success teaches actors how to be smart, pro-active and strategic throughout their career journeys. Lemack teaches actors the critical, non-performance skills they need to build the careers they want - and how to apply those skills in positive, professional and productive ways. Back Stage calls The Business of Acting a "must read" for actors. The New Business of Acting explores the revolution taking place in how business is conducted and how those dramatic changes impact how actors must conduct the business of their own careers. Certain to become another "must read," this empowering new book builds on the lessons taught in The Business of Acting, while addressing how to apply those lessons to the digital and economic landscape that is the "new" business of acting. Key chapters explore the changing roles of agents and manager, as well as the new demands on casting directors in the new landscape. Readers will learn the art of managing expectations, a required skill in learning how to act (and when not to) on the global Internet stage of self-submission opportunities. Creating and launching an action plan for success requires a perspective and an education on how to use the tools available to you and how to be a smart actor, always, along the journey. It's not about talent and performance; it's about planning and process.